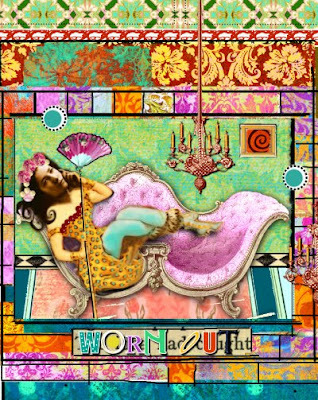 A great new challenge blog "Collage Obsession"
Theme this week is "Worn Out"
Crazy, beautiful colors! I love your worn out Diva! OMG your work is really special. A Big Applause for this. Love them. OMG! This is absolutely fabulous, colors are stunning, I love every detail. Thank you for participating our challenge and creating so gorgeous work. Oh, I just love her!! 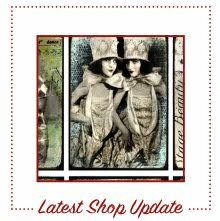 Most inspiring...:0) I must check out Collage Obsession. You make such wonderful art Julia! I looooove this!!!!! That is so great. I didn´t even recognize Sarah from the picture, but she is there after all...Wonderfull Art ! Wil je geloven dat ik hier ffkes met mijn giegel open hang Julia !! Ongelooooflijk wat een collage !!! Het spat werkelijk van mijn scherm af..zo mooi!! Just love the colors surrounding the worn out diva! She must have had a tiring day running from the paparazzi! Oh My gosh! This is extrodinary! What a beautiful job you did! Very nice, Julia! Nothing like a nice rest from having been "worn out"! Wonderful colors! I really love this!!! Clever and sure carries the theme! Wow, this is gorgeous - You really let your imagination fly! And the way you use colors, it's awesome! Hoi Frulia :D - mijn eerste blogrondje weer, na maanden van afwezigheid. Goed voornemen voor 2010 - weer scrappen. Ik hoop dat ik het waar ga maken :) Je maakt nog steeds supermooie dingen zie ik, you colourful woman! Totally unexpected treatment of the theme. Love it! Your collage work is so delicious! I love all the pretty colors, so perfectly composed for the theme! Hope you have a great weekend!! Jammer dat het allemaal in het Engels is. Kan het goed lezen, begrijp het ook, maar de essentie van een opdracht ontaagt me wel vaak. Thanks for your comment on my blog! Your entry is fabulous - so colourful! WOW, wow and wow, this is fantastic!! love your colage!! your use of colours is fab and so is your composition! !